VERONES is proud to bring you a Glass jar set, specifically designed to maintain, preserve and contain your precious goodies. With a myriad of uses including preserving jams, jellies and sauces, canning vegetables or dried fruit, along with non-food options such as home organization, decoration and gifting, you won't struggle to make your way through this nifty 15 pack in no time. Each stunning classic design quilted jar is made from thick, durable, clear, chemical-free glass, and is ideal for canning food. At VERONES we inspect every item before delivery and pack well to ensure they arrive undamaged, to ensure you won?¡¥t be disappointed with your order. your problem quickly and efficiently. 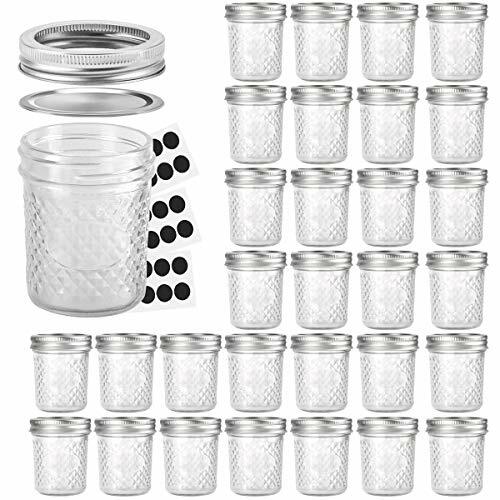 SET INCLUDE:Case of 30 Mason Jars and Silver Lids, Free 30 Chalkboard Labels.This glass jar set is of the highest quality and designed for your convenience. FOOD GRADE:Each mason jar is made from food grade materials.Great for food storage. HIGH QUALITY:Thick 6oz VERONES mason jars with food-safe, corrosion resistant lids - material is certified safety standards. VERSATILE & MULTIPURPOSE:These vintage style, attractive, quilted jelly jars are ideal for shower gifts.Make a Thoughtful Gift - Fill With Preserves, Spices, Jams, candle,or Honey - Decorate With String, Ribbons, Bows, or Twine to Create One-of-a-Kind Wedding Favors. DURABLE:Refrigerate up to 3 weeks, freeze up to 1 year, fresh preserve and store up to 1 year.